Would you like some more Twitter in your WordPress? We got ya. As an update to our ever-popular Tweet embedding functionality we’re supporting Twitter’s new embed API to enable richer, better looking, and more functional Tweets inside your blog posts. To embed a Tweet just put a permalink to it on its own line or use our new shortcode that allows for extra formatting. But wait, there’s more! Have you ever wished that when you’re on Twitter and come across a link to someone’s blog post, like this one, you could see a preview of the post without having to click on the link? Now you can, our friends at Twitter have made it so that all wp.me links can be previewed, including snippets of posts and photos, directly on Twitter.com. In addition to this being something I’ve personally wanted for a while, we think it’ll get a lot more people visiting your blog. Finally, if you link your Twitter account on your Gravatar profile we’ve made it so it’s easy to follow you right from that page. Now go forth and tweetify. P.S. You can follow me on Twitter here, and WordPress.com here. This is a great new feature! You’ve been busy creating these improved features for WordPress; thanks! Oh awesome. I like it when different web service providers work together to enhance both of their products’ potential. So if I tweet this, it’ll be very “meta,” right? Hi Matt, thank you so very much for bringing more twitter to us. But there is one thing I and many other users wanted. When someone retweet a post from the official tweet button, it automatically adds via @wordpressdotcom Is there anything you can do to give us via @authorhandle in the tweet. I hope my request will get your attention. Thank you so much for being wonderful. Hi! New posts that go through publicize will actually now automatically use your own Twitter handle in the tweet. These new features coming to Jetpack soon enough? With Twitter’s new interface you can actually click embed and select the HTML code. This code will work on WordPress.org blogs. We are planning on including the shortcode and auto embed in Jetpack but they are not there at this time. Anything already in existence or coming for those of us who want our Twitter Content to actually become blog posts on our WordPress blog? Not sure of how this would work (via a special hashtag?, etc) but there are instances where I tweet something or RT something and wish that it would have been a blog post on my blog. Then it would be permanently recorded with the comments/replies that followed. Also to be forever searchable in Google, etc. Hi Shahryar. There is not currently a feature like this but thank you for the suggestion. You can display Tweets automatically in your sidebar using our Twitter widget and you could embed the Tweets in post using the new shortcode. Sweet Matt thanks for the update! I tihink that it’s fantastic what you’ve done. This makes twitting and viewing so much easier and faster. You get a thumb’s up from me for a job well done! God bless! But will twitter retain the time stamp to redirect to the post URL? The time stamp within the Tweet will redirect to the specific URL for the Tweet on Twitter.com. This is great. I wish everyone would leave a Facebook, Twitter, etc icon on their content to make it easier to follow them. It’s coming …..
WordPress.com makes it even easier for people to add Facebook, Twitter, and more with our sharing options. Thanks for the feedback! Ha! All Matt’s posts are food pictures anyhow. Justin, this only works on wordpress.com blogs? We have WordPress but our own hosting, and it doesn’t work? The shortcode has not been released for Jetpack yet, but you can actually take the HTML embed straight from Twitter (on Twitter’s new version there should be an embed link) and use it for self-hosted blogs. The shortcode is required here because of our filtering. Each day is more rewarding in WordPress blogging! The team’s attention to their bloggers is always something to be highlighted and are very grateful for this! Great addition! By the way, when is wordpress.com going to come out with a widget that displays the top commenters (and shows how many comments)? I would really like to see this because many people have been asking about it! We actually have a “Top Rated” widget that can be selected to show comments. i haven’t understand this upgrade so well, you can embed your tweets and you can retweet them in your blog with embed options? or i have it understand it wrong? You can embed your Tweets within posts or pages and viewers of your blog will be able to reply or retweet your Tweets without leaving the page. this is so good, i have it understand it now, keep up the good work, is this opt ion available on wordpress.org? Long and Short, and very Sweet! Ventured out into the twitterverse, managed to survive alive!, and already came back with a new reader! Thanks for the info, I am just getting started, and I need all the help I can get. Make sure to check out our support resources if you need any help. Thanks for updating this feature! A tweet a day keeps the blues away. 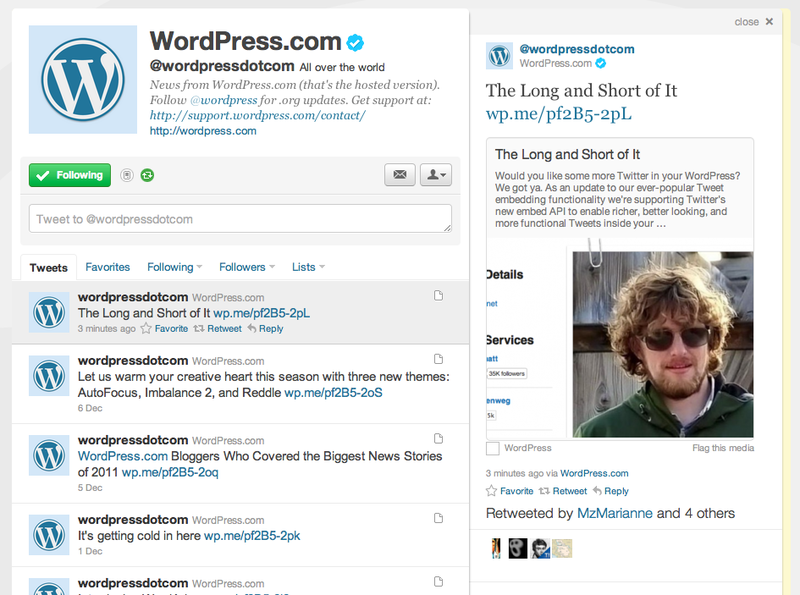 My two favs, Twitter & WordPress, working together…. Love it! Hey Matt very nice information was that . kindly would you tell me how could i change color of the tweet? is there some kinda ‘color’ code? There is currently no way to change the text color of the Tweet. Most of the elements are pulled from the Twitter profile of the user who originally created the Tweet. You guys keep surprising us! Keep up the good job and more surprises! Really like the preview in twitter that has been implemented! It just keeps getting better and better guys! Thank you! Nice to know that the web and my tweets will be linked. This is great news! Is it possible to adjust the width of the tweets? I’d like to make the tweets to be 100% on my new site. Much obliged! thats so great, love it! !